As I listen and transcribe the interviews for the story of Children’s Camps International, I am continually awed. One of the stories is about the Harvest event CCI organized in 2006 to raise awareness and support for their overseas children’s camp work. This story will be going into the book I’m writing, but I can’t stand the excitement and need to share some of that with readers now. The leadership of CCI is always on the lookout for projects that will bring in prayer and funding for this aspect of God’s work. In the winter of 2006 they came up with the idea of beating the Guinness World Record for harvesting a wheat field. Local businessmen and farmers donated land, time, resources, seed, fertilizer, tractors, and 105 combines...everything needed to plant and harvest a quarter section in record time. Ray sat back. Why was he looking at the forecast when he could talk to the One who controls the forecast? He closed his laptop and prayed. At 10:30 Ray joined the farmers congregating at the field. 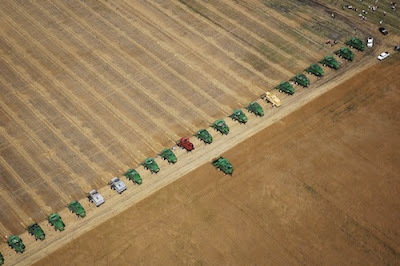 Their combines were ready to go. Ray and the farmers walked along the wheat. The media and a helicopter was scheduled to arrive at 1 pm. Thousands of spectators were coming. Entertainment was going to be provided. The curtain was about to go up. The farmers shook their heads and grumbled. Tension crackled between Ray and the farmers as much as it did in the atmosphere. A storm was coming. Every instinct in these farmers was that rain would finish them. They needed to cut that field now. Ray walked a distance from them and prayed. After months of organization, after the pledges of people, after all the prayer and encouragement from God—was this project going to fall flat, go out with a whimper? Would God test him that much? They needed more prayer—serious prayer. Ray ended his call and continued to pray. Five minutes later the house shook. Windows rattled. Lighting had hit somewhere. Ray raced back to the field. The rain fell. But the clouds rolled around the field. The surrounding area was soaked just as the farmers predicted. Later the farmers slapped each other on the back and laughed. God had sent only enough moisture onto the field to dampen the dust as the combines roared across the wheat. That tiny bit of rain that landed on the field lessened the chances of fire with so many vehicles on the field at one time. CCI beat the harvesting record that day, but for some obscure paper technicality, Guinness didn’t give the record to them. But CCI is going to do it again—even bigger, faster. The 2006 Harvest was the rehearsal. Harvest 2010 will be the show. It is an event I am planning to attend this August 7 in Winkler, Manitoba. If you’d like to know more about this event, and how you can pray for it, or support it, here’s the website, Harvest for Kids, and click here for their face book account. Make them your Facebook friend to keep up on how the Harvest is going. If you drop by their Facebook and say hi, please tell them Christine sent you. There will also be a coffee table book you can purchase that will highlight parts of the CCI story, as well as the Harvest. And maybe I’ll even have an article or two in that book as well. I hope you’ll join me and many others as we support this event, and this very worthy organization. It’s for the kids—the kids all over the world who need to hear about Christ.